A popular trend among various home video labels nowadays is to compile a collection of movie trailers and present them on disc as the main feature rather than as an extra. Notable favorites include both the 42nd Street Forever and Trailer Trauma series. 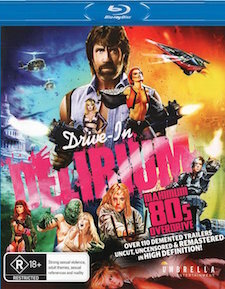 Umbrella Entertainment has taken their stab at this extremely niche market with two Drive-In Delirium releases: ‘60s and ‘70s Savagery and Maximum ‘80s Overdrive, the latter of which we’re taking a look at today. With a total of 146 trailers, it’s certainly a monumental set of vintage marketing materials to cull through, but if you enjoy watching them, this collection is right up your alley. Split into two parts with the option of watching everything all at once, there is a pre-show, intermission, and post-show, all of which contain vintage commercials and drive-in advertisements. In Part 1: The Crackdown, which contains 51 trailers (all chapter divided), there’s Shogun Assassin, Raw Force, Chained Heat, 9 Deaths of the Ninja, Stripped to Kill, To Live and Die in L.A., Code of Silence, Invasion U.S.A., Black Moon Rising, Biggles (aka Biggles: Adventures in Time), Used Cars, Wacko, Up the Creek, Dressed to Kill, Road Games, Blow Out, Blood Simple, 52 Pick-Up, Crimes of Passion, The Exterminator, Ms. 45, Death Wish II, Class of 1984, Vigilante, Escape from the Bronx, The New Barbarians, Dead End Drive-In, Metalstorm: The Destruction of Jared-Syn, The Dungeonmaster, Zone Troopers, Eliminators, Sorceress, Saturn 3, The Thing, Space Raiders, The Terminator, The Ice Pirates, RoboCop, Miracle Mile, They Live, Gnaw: Food of the Gods 2, Breakin’, Zombi Holocaust (aka Doctor Butcher, M.D. ), Nightmare City, Cannibal Holocaust, Contamination, The Beyond, The Black Cat, The New York Ripper, Demons, and Demons 2. In Part 2: Stalk ‘N Slash, which contains 65 trailers (all chapter divided), there’s Maniac, The Children, Friday the 13th, Friday the 13th Part 2, Friday the 13th Part 3 3D, King Cobra (aka Jaws of Satan), Prom Night, Terror Train, To All a Goodnight, Christmas Evil (aka You Better Watch Out), Don’t Answer the Phone, Don’t Go in the Woods, Just Before Dawn, Schizoid, Mother’s Day, Graduation Day, My Bloody Valentine, Halloween II, Nightmare, The Burning, Madman, Pieces, The Final Terror, Curtains, Texas Chainsaw Massacre 2, Sorority House Massacre, Hollywood Chainsaw Hookers, Nightmare Weekend, Chopping Mall, Blood Diner, The Stepfather, Venom, Macabra (aka Demonoid), Mutant, Creepshow 2, Evil Dead 2, The Blob, Day of the Dead, The Monster Club, Fright Night, The Return of the Living Dead, Night of the Creeps, Night of the Demons, The Monster Squad, Bride of Re-Animator, Death Ship, The Fog, The Nesting, Deadly Blessing, Scanners, Halloween III: Season of the Witch, Christine, The Horror Star (aka Frightmare), Amityville 3-D, Children of the Corn, Cat’s Eye, Night Train to Terror, Nomads, Prison, Bad Dreams, Child’s Play, Phantasm II, Waxwork, Death Spa, and Shocker. The video and audio quality is much better than what you might expect. While some of the drive-in advertisements are occasionally low grade, all of the trailers have been HD-sourced. They’re not squeaky-clean as they do still contain instances of scratches, speckling, and other types of film damage, they’re quite presentable and stable throughout. The sole audio option for everything is English 2.0 Dolby Digital with no subtitle options. Each trailer’s soundtrack is mostly clean and clear with next to no real interference, other than occasional distortion and light crackle, which comes hand in hand with the quality of the trailers themselves. Two extras are also included: an animated poster gallery and a trailer for the Blu-ray itself (not that any extras were really necessary for a set like this). The inner sleeve is also reversible and contains slightly alternate artwork with a list of all of the trailers. There’s not much more I can do to recommend this set. It certainly gives you a peek at a lot of different films that you might not otherwise have been aware of, and thanks to Drive-In Delirium, you’re likely to queue up your various streaming devices and Blu-ray and DVD wishlists with new titles to check out. It’s a great collection, and one can only hope that perhaps a ‘90s collection is somewhere on the horizon.